In July, Victor Hammer #6–the infamous Sarah Bryant–will return to the Wells Book Arts Center to teach Boxmaking during the Summer Institute. The course titled A Box is an Invitation: Enclosure Design and Production will be an opportunity for students to design and produce beautiful enclosures for personal collections of objects, books, prints, or other mysterious contents. This course is almost full! Who better to learn the ins and outs of good boxmaking from than Sarah Bryant?! Not only is Sarah an accomplished binder and book artist, but anyone who has studied with her will tell you SHE IS A LOT OF FUN. Katie Baldwin (VH #7) interviewed Sarah Bryant (VH #6), in order to give us a peek into her studio work and to gain a little insight on what exactly what makes her tick! KB, VH #7: Sarah, what are you working on in the studio? SB, VH #6: These days I am caught between the satisfying allure of binding up older projects, and the strong pull of something new. 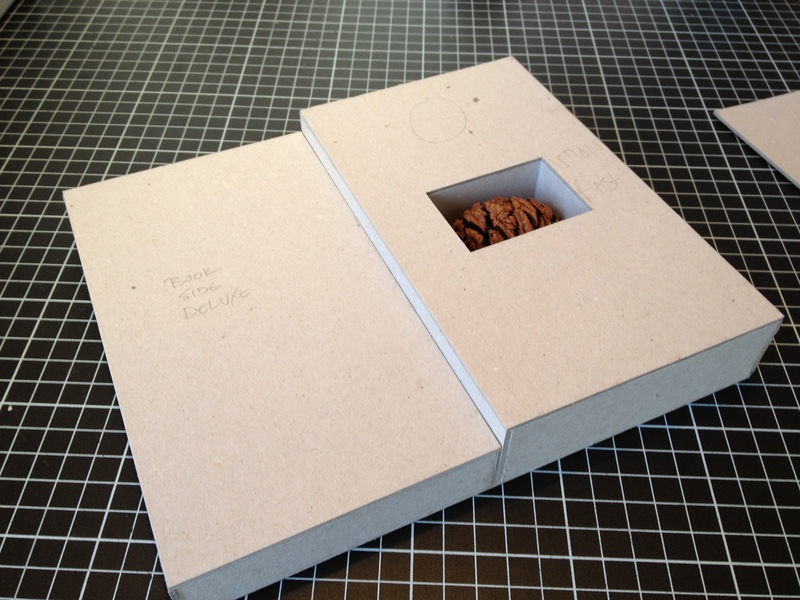 Today, for example, I’ll be continuing to produce boxes for a special edition of my last book. Making these boxes is fun because each of them will hold a book, a set of prints, and an object. I love making complicated things like this, and every box I finish brings me closer to finishing the entire project, which dominated my life for a solid year. SB, VH #6: Clipped to a line just over my head is is something unformed that I am working on with a science-side friend of mine. It’s not quite ready to talk about, but it is the beginning of a project that has its origins in population statistics. So ask me at the Summer Institute and by then I’ll be able to I’ll tell you everything. And maybe show you a draft? My last book was very personal, and while I loved making it and trying something new, I am looking forward to moving away from it and delving back into something science-related. KB, VH #7: You have participated in the Summer Institute as both a student and instructor, what are you looking forward to most this summer at the Book Arts Center? SB, VH #6: I love the Summer Institute. I am most looking forward to: seeing old friends, meeting new friends, swimming in the lake, drinking finger lakes beer, and soaking in the general buzz of people working non-stop on book projects. I am thrilled to teach box-making this year; there is some kind of specific satisfaction that comes from making beautiful boxes out of raw materials. Once you learn the basics, a whole complex world opens up to you. Students in my course will start simply, but end with individual projects tailored to things they bring. Also they can look forward to my weird habit of making my bookbinding tools talk in funny voices. I don’t want to do it, I don’t like that I do it, but I always do it nonetheless. KB, VH #7: Something I really love about your books is the incredible balance you achieve between content and craft. I know as an artist, making things is a process that is not just a progressive or linear path. But I wonder if you could speak to the way in which you achieve balance between content and craft? SB, VH #6: The relationship between content and craft is is complex. While they are obviously very different things, I do believe they are related in certain ways. A high level of craftsmanship lends authority to the things you make. More people will give your content their attention if it is presented deliberately and cleanly. Certainly there is room for quick and dirty books, or books that seem to have a low level of craft, if that choice is related to the content of the book. But a rough-looking or poorly executed binding will be read as related to the content whether that is your intention or not. The structure of a book (not exactly ‘craft’ itself but certainly a function of craft) is critical for the content of any book. There are innumerable structures and variations to work with. I develop the content and structure simultaneously, churning out three dimensional book-drafts frequently in all stages of the design of a book. I think the worst crime you can commit is to think of an unusual structure first and then try to manipulate and squeeze some unrelated idea into it. When I work, I start with an idea. I try it out in a number of rough mockups, and am always willing to abandon a structure if it isn’t not working. I am also ready to make changes to the content, however. Sometimes the structural experiments I do in the mockup stages actually lead to interesting re-considerations of the content, giving me ideas about how to group things together, for example, or helping me to see what portions of the content are not working with the rest. So it goes both ways. I should also say here that I abandon many of my ideas in the early stages if they are clearly not working. Sometimes an idea, even a good idea, is just not big enough for a book. I file these away for later and hope they join up with something else, or mature in the primordial soup. SB, VH #6: Join my cult and find out. The fees are reasonable and you gain access to the compound, where we mostly talk about the legibility of natural science museum displays and then eat astronaut ice cream until we feel a bit ill.
KB, VH #7: Lastly, What is the Sarah Bryant’s pick for the best ice cream from Cream at the Top (1296 State Route 34B, King Ferry Station, NY)? SB VH #6, Small (the small is enormous) soft serve custard twist with chocolate sprinkles. Classic. Simple. AMAZING. 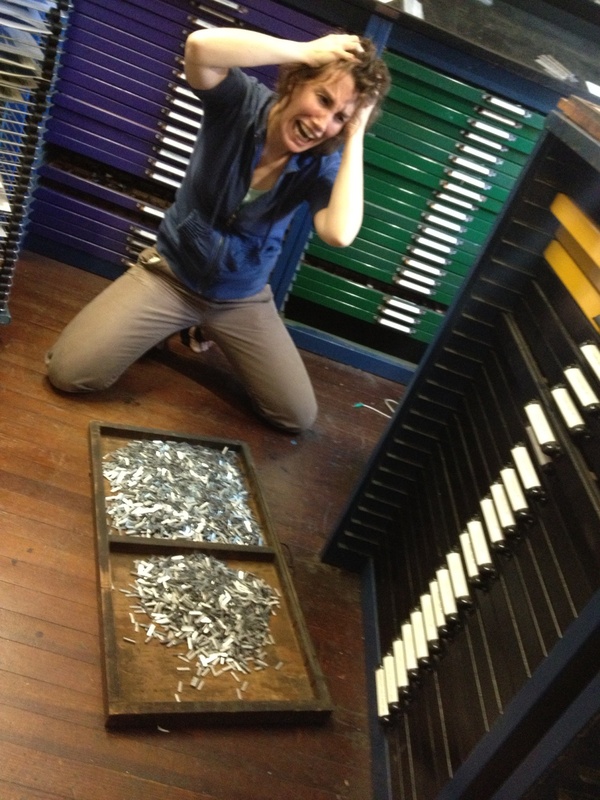 KB, VH #7: Okay, really for lastly, if you were going to make a bet on what is locked up in the Book Arts Center basement safe, what would it be? SB, VH #6: The remains of Victor Hammer’s printer’s devil. Is that too bleak? Maybe his stamp collection then. Or the Natural History museum displays. Let’s get the tools and find out. For real this time. 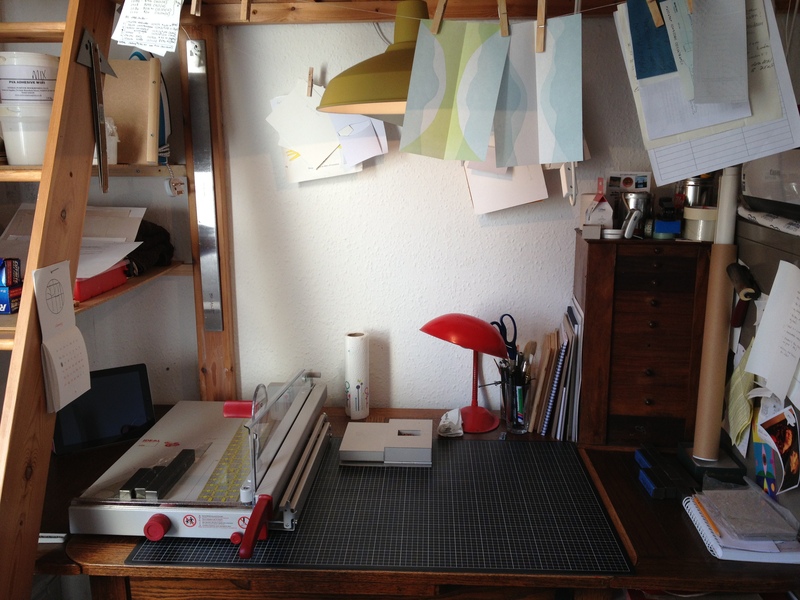 Join us this summer, for the 2013 Book Arts Center Summer Institute for box-making, bookbinding, letterpress and more. By day we will be printing and binding like mad, at night: join us in cracking the combination of the basement safe! We have to learn to take the bitter pie with the sweet. We can’t wait to have you back!! !